From art in nature to survival skills, the Kortright Centre’s programs for secondary level students offer immersive, outdoor educational experiences that engage both intellect and the imagination. WHY BRING YOUR SECONDARY CLASS TO KORTRIGHT? Our programs focus on learning through direct observation and participation in outdoor activities that will allow students to discover fascinating facts about the plant and wildlife populations and their interactions within these ecosystems. The Kortright Centre has one of Canada’s largest renewable energy demonstrations, making it an ideal setting for teaching secondary-level students about alternative energy: solar thermal, photovoltaic (solar electric), wind and biomass. Each topic emphasizes the individual’s role and responsibility in maintaining a healthy environment through sustainable living practices. All programs are designed to meet curriculum expectations at the grade levels specified, and are presented by experienced professional instructors. One Teacher/Supervisor for every 10 participating students is FREE. Each additional helper is $5.65. 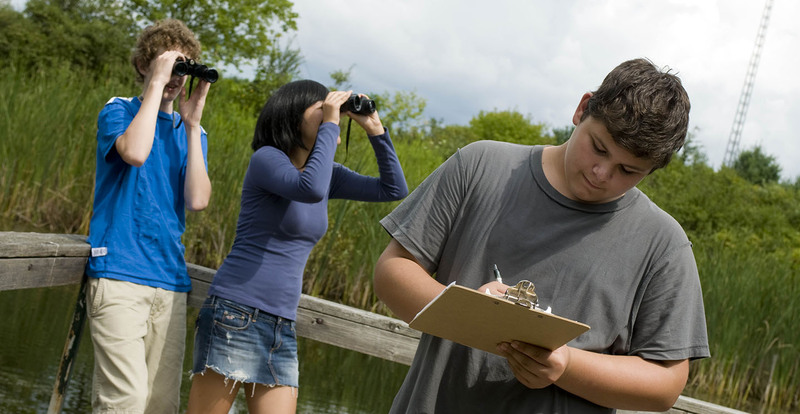 Through active participation in sampling and inventory techniques, students will conduct an analysis of an aquatic environment. 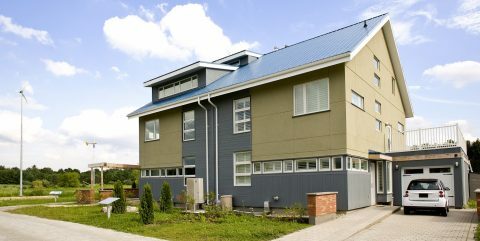 Students will tour two LEED platinum houses demonstrating a host of sustainable technologies that are available now and in the future. Students create ephemeral art in a natural landscape and discover concepts in visual arts. 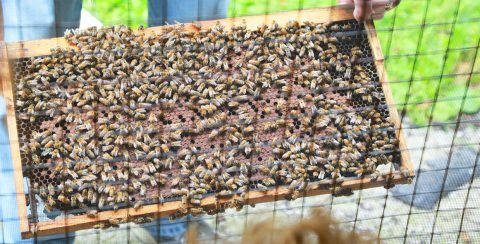 Learn the life cycle of the honey bee and the physical adaptations needed to survive inside a hive. A customized program to meet your needs. Students will focus on the causes and effects of greenhouse gases, changing weather patterns, the influence of carbon in the atmosphere and nature’s ability to recycle. Walk the Innovation Trail to learn about renewable energy technologies: biomass, solar thermal, photovoltaic (PV) and wind. Understand the importance of biodiversity and its connection to species survival. In this program, students will become familiar with GPS units by doing a series of practice exercises. Students will visit and compare two natural habitats by analyzing and collecting empirical data on the biotic and abiotic elements in each. Enjoy early Spring’s sweetness! Learn how to identify maple trees and how they are tapped for sap. 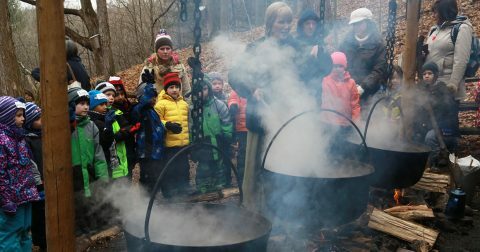 Compare past and present methods of maple syrup making. Introduce your students to nature on a general interest hike, or specify a theme and we will customize this program to suit your needs. Investigate the physical characteristics of a river and measure water flow and velocity. Observe valley features and significance of a river watershed. School Spirit Day is a fun, inclusive, interactive day for students and staff, ideal for the beginning or end of the school year. Enjoy the forest in winter on a snowshoe hike along our trails. Learn what to do if you get lost in the woods. Work in small teams to build a fire and a shelter to keep your group warm. Students will visit the 10-acre Kortright Organic Farm to learn firsthand where food comes from and see how everything on the farm is interconnected. This special program allows participants to develop group skills such as working together, sharing ideas, trust, problem solving, patience and leadership. Programs always have an outdoor component. Groups should dress for the conditions on the day of their visit. Before your visit, please discuss the importance of dressing appropriately for outdoor activities. On days of inclement weather the program will be modified to include some indoor activities along with the outdoor components. Kortright Centre has partnered with bypeterandpauls.com to make optional boxed lunches available for school groups. Please see below for menu selections. We are pleased to offer ONE complimentary admission to teachers and supervisors for every 10 participating students. Please note that most Kortright programs can be adapted for groups with special needs. NEED HELP WITH YOUR BOOKING? Call 416.667.6295 x 602 (Monday to Friday, 9:00 am to 5:00 pm). Beverages: All boxed lunches include one soft drink, juice or bottled water. NOTE: Food orders must be placed at least one week prior to visit date.